Restrictive digital rights management just acts as a challenge to pirates and crackers. CD Projekt has been on the front lines of the consumer's right to play the game they pay for without having to log in, authenticate, or deal with any kind of DRM. GOG.com - owned and operated by CD Projekt - has been selling games without any of that stuff, and the business model appears to be working. 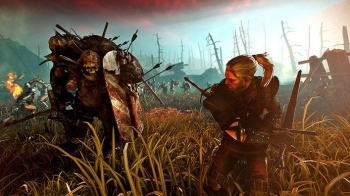 The Polish publisher even released its own Witcher 2 on PC without any DRM attached to it. GOG's managing director Guillaume Rambourg spoke to Forbes at length about why DRM doesn't help the fight against piracy, and why CD Projekt will never, ever, sell games with DRM attached again. "First of all let me dispel the myth about DRM protecting anything. The truth is it does not work. It's as simple as that," Rambourg said. "The technology which is supposed to protect games against illegal copying is cracked within hours of the release of every single game. So, that's wasted money and development just to implement it." There's no challenge for pirates to "crack" a game with no DRM on it. "The illegal scene is pretty much about the game and the glory: who will be the first to deliver the game, who is the best and smartest cracker. The DRM-free version at GOG.com didn't fit this too well," said Marcin Iwinski, CEO of CD Projekt Red, the developer of The Witcher games. Rambourg goes on to say how the user of a pirated copy almost always has a better gaming experience than someone who bought a game with DRM legitimately. "Quite often the DRM slows the game down, as the wrapper around the executable file is constantly checking if the game is being legally used or not. That is a lot the legal users have to put up with, while the illegal users who downloaded the pirated version have a clean - and way more functional! - game. It seems crazy, but that's how it really works. "I do not see any future for DRM at all," he said. "We use no DRM and we never will." Even though CD Projekt knows that The Witcher 2 was downloaded illegally more than 4.5 million times, Rambourg firmly believes that figure does not translate to lost sales in a 1 to 1 relationship. "I would rather say that a big part of these 4.5M+ pirated copies are considered a form of trial version, or even a demo. Gamers download [pirate copies] because it's easy, fast, and, frankly, costs nothing. If they like the game and they start investing the time, some of them will go and buy it. This is evident in the first Witcher, where the total sales are 2.1 million units at present and the game is still doing well, although it is already 5 years old." Just think of all this when you boot up Diablo III. Sorry, low blow.